The vase is brightly enamelled with shaped panels containing a single phoenix standing amid sprays of pink and blue peony blooms and foliage against a pink background, surrounded by a green-ground decorated with further pink and blue peony blooms and foliage. The neck and shoulder have moulded felines with green bodies and dragons in pink, as well as cartouches with a single peony bloom against a pink background. The lower part of the base has a border of brightly coloured pale green lappets, and a further pale green border is just beneath the rim, which has gilt edging. 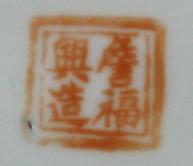 Zhanfuxing Zao factory mark in red enamel.